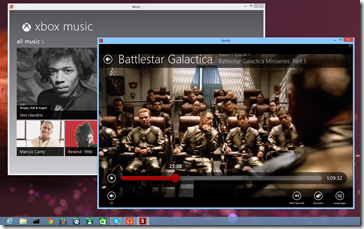 Stardock released the first BETA of ModernMix today. 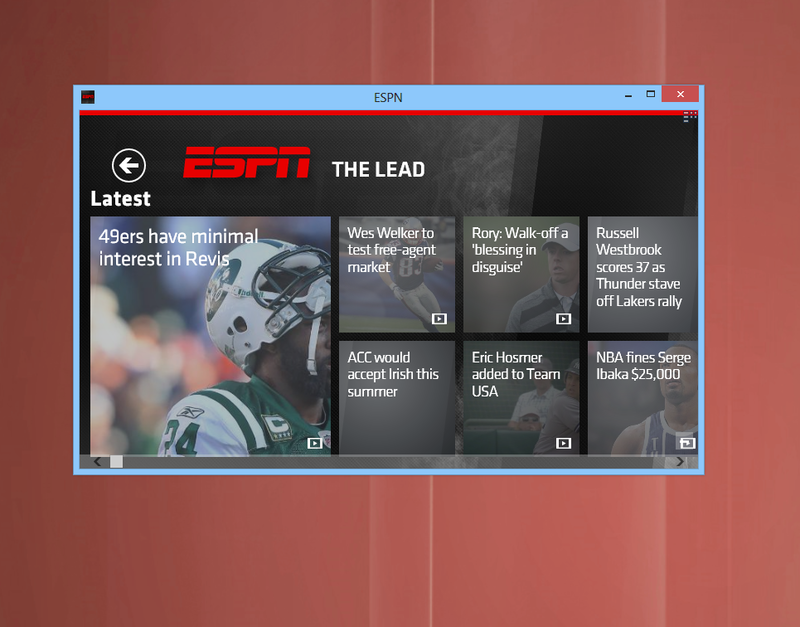 In a nutshell: Modern apps (often called Metro or RT apps) on Windows 8 are forced to run full-screen no matter what. 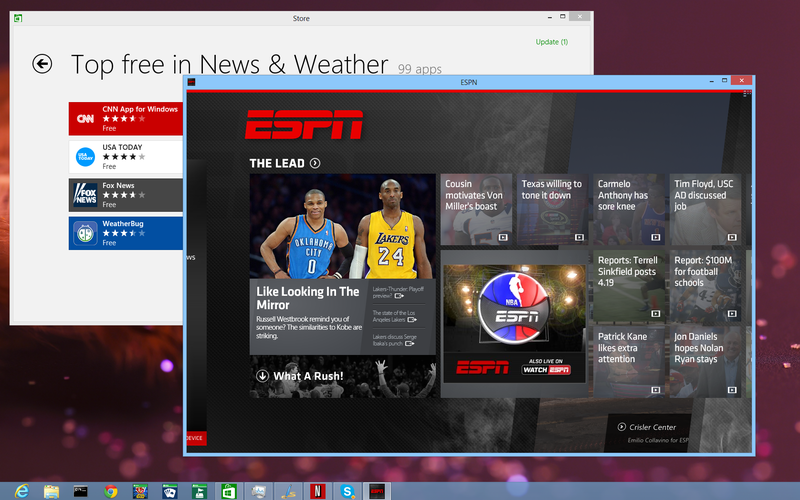 If you have a 20 inch monitor (or larger) you know how absurd it is for many of these apps to be running full-screen. 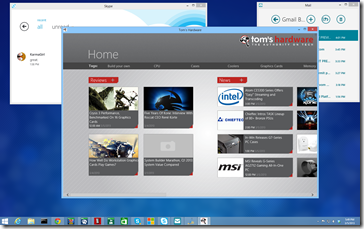 Once ModernMix is installed, all those Metro apps can run windows on the desktop. They even show up on the taskbar which means you can pin them for easier later launch. There’s a really good Metro version of Netflix. But without ModernMix, this has to run full-screen. If I want to watch Netflix full screen, I’ll watch it on my TV. The whole point of watching something on a PC is that you can have it in a window while you do other stuff. This brings me to the second window: The music app. Every time I want to mess with my play list or whatever, I don’t expect to have to switch to a big full screen app to do this. iTunes doesn’t make me do this. 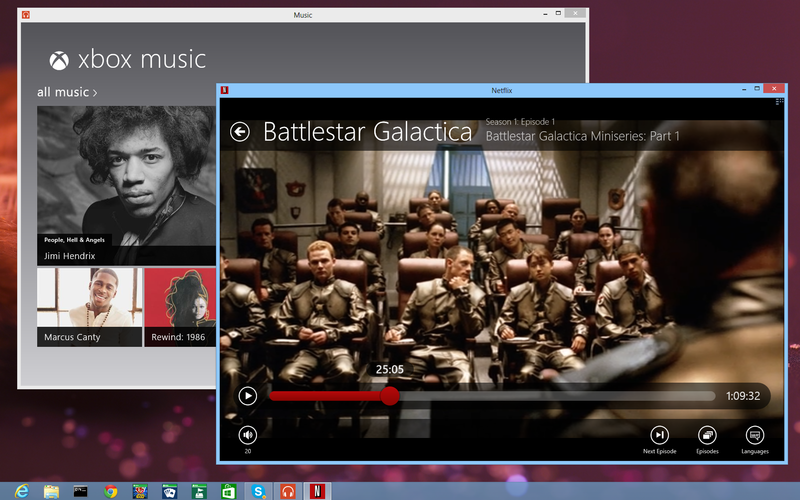 But the Windows 8 music app does – unless you have ModernMix. Now I can keep it in a little window if I want and click on it if I want to do something. 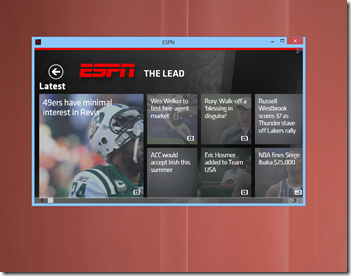 One of the best Metro apps on Windows 8 is the ESPN app. But again, on my desktop PC, why would I want to have this app be full screen? One nice thing about ModernMix is that those windows are resizeable and most of them, remarkably enough, almost seem to have been designed to be resized. 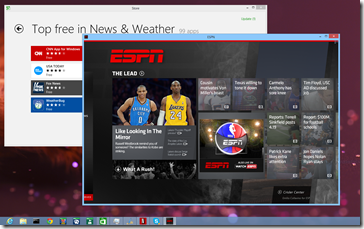 The result is that ModernMix suddenly makes the Windows 8 app ecosystem relevant. I’m finding myself actually interested in them because they don’t get in the way of the other things I’m trying to do with my PC. As a practical matter, no app can be designed to be all things to all people in terms of the user experience. That’s one of the reasons having windows on the desktop works so well. I might be running at 1024x768 and you might be running at 2560x1440. That difference leads to a very distinct user experiences. But if apps are forced to run full-screen the app designer has the challenge to create something that will work in all these different conditions. But when you run them in a window these apps can really shine. 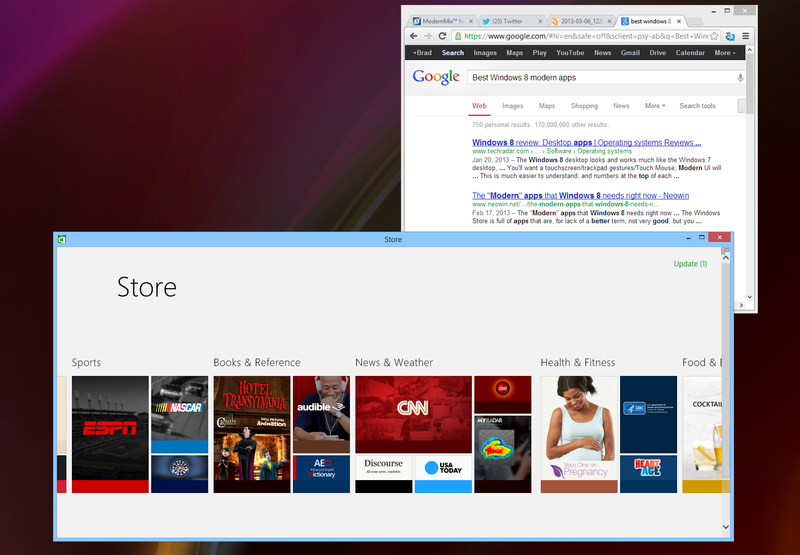 Ironically, the Windows 8 store runs as if it were originally designed to run in a window. 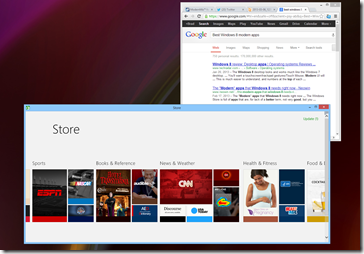 By being able to run it in a window I can (like I do with my Mac) search for things on the net and then look for them in the Windows store. 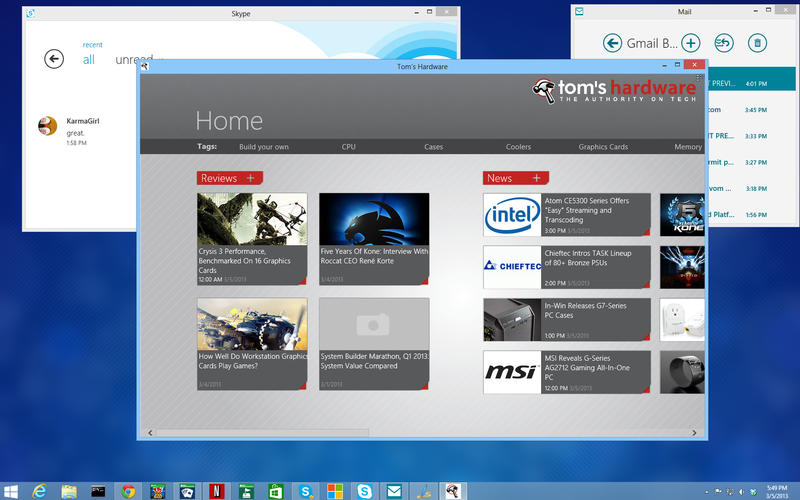 When you combine Start8 with ModernMix, the end result is that Windows 8 becomes an indisputably better than Windows 7. With Start8 and ModernMix you can run your entire Windows 8 experience from the desktop and enjoy all the advantages that Windows 8 provides. Hey, now I can play Solitaire and listen to music at the same time! A program that let you create your own start tiles would be cool. I tried and you need like four versions of the image in a .ico file and access to a folder that even an Administrator doesn't have permission to.